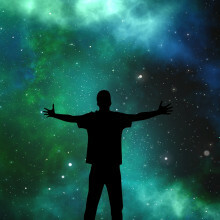 This week we’re exploring the cosmos through your senses. How scientists are attempting to see a black hole for the first time, what Jupiter sounds like, and what will the surface of Mars feel like. Plus how to make the immune system attack cancer, artificial intelligence invents a magic trick, and how goldfish swap oxygen for alcohol to get through the winter. The immune system can be programmed to attack cancer, but it doesn't always work, and doctors work out why. Nicholas - For the immune system to see the cancer, the cancer must be able to present itself as foreign to the immune system. And the cancer requires the expression of particular genes and, if those genes are not present, the immune system simply cannot see the cancer. We systematically knocked out all protein encoding genes within the human genome and we found there were about 100 genes that were essential for the immune system to recognise tumours. Chris - Have you gone a step further and said well, if we go and take cancer cells from a patient who has not responded to immunotherapy can we indeed see that this 100 or so genes that you’ve found to be critical are messed up or broken in that patient's cancer, thus explaining why they haven’t responded to the immunotherapy treatment? Nicholas - Yes. We analysed over 11,000 patients with cancer and we correlated gene expression that we found using our screen with those patients, and we found very interesting overlaps with that dataset. In addition, we took about 200 patients that had received immunotherapy. Some of them responded to the immunotherapy and some of them didn’t. We are particularly interested in the patients who did not respond and, yes indeed, we found that many of those patients had problems in the genes identified in our screen. Chris - Does this mean then that you have in your hands potentially quite a powerful prognostic tool because you could take a tumour from somebody, you could see if it has this constellation of 100 or so genes that are necessary intact, and then say well, the chances of you responding to immunotherapy pretty good or, if they’re broken, those genes, the chances of you responding are less good? Nicholas - Yes, that’s a very interesting and important question. The dataset that we have now will enable us to make a guess what the best kind of therapy is for a patient.To give an example: if we have a particular kind of white blood cell from the patient that needs to recognise particular structures on a tumour cell that simply aren't there, then that patient might benefit from a different treatment. So yes, the dataset could guide us towards picking the patients that will ultimately benefit but, most importantly, the dataset might help us create new drugs or new work-arounds. So, if the immunotherapy that we’re using to treat a patient has something missing then we can potentially provide that signal to the patient so that the immune approach that we’re using can still succeed. 05:08 - What's in our universe? Ofer - We’re really looking for the unseen. It might sound a bit contradictory that we are actually observing light and trying to figure out the dark matter component of the universe. The current picture we have which is very much supported by the data just released by the Dark Energy Survey suggest only 4% of the cosmic budget at present is made of ordinary matter, the stuff we see around us in everyday life including trees, and waterfalls, and ice cream. The remaining 96% is dark and we think about 26% is in the form of a cold dark matter and 70% in the form of dark energy. Izzie - So, can you tell me, what exactly is dark matter and what is dark energy? Ofer - Dark matter is probably due to some particle which we haven’t found yet. The problem has been around for over 80 years, and we see it because when we look the way stars move around the galaxy, it turns out that we cannot explain the rotation of stars in the galaxy just with ordinary matter, we have to evoke this extra component. Similarly, with dark energy, we cannot explain what we see. The pattern of galaxies and the distortion of distant galaxies, we cannot explain without putting in this component of dark energy. It’s still a big mystery, what are these components? So that’s why it’s so important to map those ingredients. Izzie - So you’ve mapped the sky, you’ve mapped all these distant galaxies, what do they actually look like? How does dark energy and dark matter affect that image? Ofer - I should also mention the area covered in that map of the dark matter. It’s only 3% of the sky but, in fact, it’s quite big. In fact, you can accommodate more than 6,000 full moons in that area. This map was produced by looking at the images of 26 million distant galaxies. For each of them, the collaborators actually measured the shape. Now what this shape tells you is, in part, it tells you what the actual galaxy looks like in reality. But also, this shape gets distorted by a very small amount due to the intervening matter between us and that galaxy and, from the amount of distortion, you can infer what the dark matter between us and those distant galaxies. That’s exactly what this Dark Energy Survey collaboration has done and pictures are better than a thousand words, so I encourage people to look at the pictures. Izzie - What can we do with these new findings? Ofer - Those finding provide us with some of the most accurate measurements of the composition of the universe at present. 94% of the universe is dark. 26% dark matter, 70% dark energy, and only this 4% of ordinary matter. The universe is expanding; we’ve known that a long, long time since the discovery by Hubble but, since the discovery by the Supernova team, it seems now the universe is actually accelerating, and these results we got from Dark Energy Survey support that. The point is that you can think about different hypothetical universes, and then we take the one we map with that telescope and compare it to all these hypothetical universes and see who the winner is. And then we say well, that’s probably the universe we live in. The results published today are based on the first year - well, hopefully, the best is still to come. How a space station in critical danger led to the development of the shiny metal blankets that prevent marathon runners from getting hyperthermia. Stuart - What happens when the science and technology of space come down to Earth? This is Down to Earth from the Naked Scientists. I’m Dr Stuart Higgins and in this mini series I explore how technology developed for space is used in other applications here on Earth. Before the International Space Station there was Skylab. Launched by the United States in 1973 as a space base laboratory, Skylabs deployment didn’t go quite to plan. During takeoff, part of the space stations meteorite and heat shield tore away and, without shielding, temperatures inside the spacecraft quickly rose threatening the mission. NASA needed a quick solution that could be put in place easily by astronauts who were about to travel up to Skylab on the next rocket. They needed a material that could reflect heat over a large area and also be folded up neatly in order to get it into space. Metal coated plastics weren’t new to NASA, they’d previously developed them during Project Echo where giant metal covered balloons were placed into space to act as reflectors for radio signals sent from Earth. While the process of metallisation had been around long before that, it was the stringent requirements for manufacturing these materials for use in space that led to the development of a much wider industry. That ultimately led to the creation of thin, thermally reflective sheets, sometimes referred to as space blankets or emergency blankets. You’ll see marathon runners around the world using them to keep warm at the end of races, or on people stuck up mountains trying to maintain their body temperature while they wait for help. By placing the metal side towards the body, the infrared radiation is reflected back towards the person rather than the other way round as it was used in skylab. Metallised plastic films are also used in a huge plethora of ways including food packaging, clothing, and continue to be used by space agencies to help protect current spacecraft. 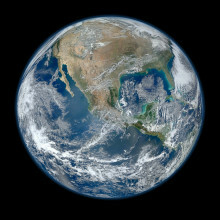 So that’s how the development of metal coated plastic for space led to emergency blankets and much more here on Earth. That was Down to Earth from the Naked Scientists. And join me again soon to learn more about space technology that’s changing lives back on Earth. Artificial intelligence will change our future. Even the future of magic tricks. As quickly as you can - think of a colour. Was it red? If it was, we didn’t read your mind, that’s just the colour that most people think of under pressure. Indeed, because we’re all the same, our brains tend to make similar associations - and mistakes - and this is what magicians often exploit to amaze and impress us. Of course, magicians have been coming up with new tricks for hundreds of years, but now scientists have given Artificial Intelligence - also known as AI - a go, to see if it could come up with a trick too. Georgia Mills asked Peter McOwan, professor of Computer science at Queen Mary University of London, if he’s a fan of magic, as well as computers. Peter - I am indeed, yes. It goes way back - I think I was about 9 or 10 and my Dad brought me a trick back from a shop that he’d been passing when he was down on a business trip to London, and from thereon in, I kind of got hooked on it. Particularly, I liked the fact that you were using a lot of secret signs and mathematics to make these tricks work, particularly in things like self-working card tricks. If you think about that, actually they’re just implementing some kind of hidden algorithm which allows you to sort the cards in a particular way. 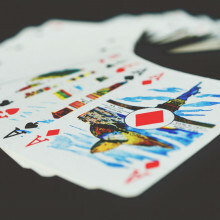 If you think about it, a pack of cards is nothing other than 52 separate data elements. They happen to be cards, they could be numbers in a computer. That was something I spotted and thought well, can I use artificial intelligence and it’s ability to take large amounts of data and process those quite quickly to create some kind of new magic trick? Peter - Not quite. The work that we’re talking about at the moment is to do with word associations. The question was could take some of those artificial intelligence algorithms and produce some new kind of word association trick? If I was to ask you to think of the first flower that came into your mind, what would your answer be? Peter - And if I had written it down on a piece of paper, which I have in fact here - it says rose. Because most people make an association, if asked under pressure to choose a particular flower, the majority of them will say rose. Similarly, there are a whole series of these kind of inbuilt biases. Georgia - This trick involved predicting a word association you’re going to make from an apparently randomly shuffled selection of images and words. By asking a lot of people and using AI bots to comb the web, they were able to come up with a list of words and images with a few strong associations that people are much more likely to pick, and many others that had no associations at all. Add a bit of clever shuffling, and a bit of pizzazz, and you make it look like you’ve read someone’s mind, when really, it just relies on the fact that most of us think in the same way. So did it work? Peter - Well, that’s a really interesting question. How do you test a magic trick? How do you scientifically approach that? The way that we did that was first of all to get people to do what’s called self-reporting, so just a list of how did this make you feel from not at all up to where I was really amazed? So you can start to get a number for that. But equally well, you can take that trick and also compare that trick against another standard benchmarking trick that we used in all the work that we’ve done, which was basically the vanish of a ball using sleight of hand. We found that in the very large majority of cases, people were wowed by the trick, they were surprised by the trick, they couldn’t work out how the trick was done. Georgia - Does this have applications outside of magic? Peter - One of the areas that I’m interested in, particularly around artificial intelligence, is how we can use that to try and understand the biological systems; how we can better try and understand ourselves? I think one of the most interesting things I did prior to the magic was I came up with my own optical illusion that was predicted by a mathematical model that we had for the way that people perceived motion. Originally, when I was running that, I got the results and I thought no, there must be a bug in the computer software, we’ll have to go in and fix it. I wasted a week of my life until somebody suggested why don’t you just code the stimulus up and see what actually happens. It was at that point when I did that suddenly I realised that the bug wasn’t in the software, the bug was in human brains because it was an optical illusion and cropped up that way. So doing these kind of mathematical models, these mathematical mimicries of the way that the brain works allows you to, potentially, come up with some new ways of understanding how the brain is processing those massive amounts of information it has to deal with on a day to day basis. So it’s useful from that point of view to try and understanding something about the human process. Goldfish can survive the winter freeze using a genetic trick that allows them to convert lactic acid into alcohol. Michael - We looked at goldfish and Prussian carp, a wild relative of them and I’ve always been fascinated by their ability to overwinter in ice covered ponds in the absence of oxygen. When the ice covers the lake, the animals underneath are closed off and they just consume all the oxygen and then they have to deal with oxygen free situations, which is very unusual and not many animals can do that. When we are without oxygen, humans and other animals - we produce lactic acid. It’s not so efficient but it just gets us a little bit of energy out of our foodstuff. But there’s a problem there that production of this acid is actually bad for you and cannot be tolerated very well. Chris - This is the same stuff that when you’re taking a vigorous amount of exercise or doing weightlifting or something your muscles begin to burn, and that’s the build-up of lactic acid in the muscle? Because the muscle’s working harder than the amount of oxygen that’s available to it at that time, so it produces lactic acid as a by-product? Michael - That’s right; this is just in the muscles. The whole animal is without oxygen then every tissue needs to do that, and soon the amount of lactic acid will overwhelm the body and it can no longer function. Chris - And that would obviously lead to death, which does lead to death in some human patients doesn’t it? Michael - It does, exactly. These animals can survive this because they’ve found a trick to convert this lactic acid into alcohol ethanol, which is what you have in beverages like beer and wine, and this can diffuse out of the animal via their gills to the environment of water. This is positive because they can survive for a time as long as they have enough foodstuffs to produce lactic acid and convert it to ethanol, but it’s not very energy efficient. What these animals do actually before they overwinter they accumulate foodstuffs in their liver - it’s called glycogen - it’s just carbohydrate, and they can use this when they are under the ice for three months. Chris - Biochemically, Michael, how do they do this alcohol creation step, because that’s effectively the same thing that yeast does when it turns the products of fermentation into stuff that we like to drink in a beer bottle or a wine bottle; that’s what yeast is doing so how is a fish able to do that? Michael - What we found out in our research by looking at close related species who can produce alcohol and overwinter, and also can’t. We found that they have these microscopic machines that chanel the foodstuffs into lactic acid. What these animals do is they have a second set of these microscopic machines due to a genome duplication, so that means the whole genetic material, by some accident of nature, was duplicated. So they have two sets and they have evolved to use one of the sets in the normal way and another set to channel the foodstuffs into alcohol production. Chris - When you say micro machines, these are effectively enzymes, biochemical pathways, and they happened by a genetic trick to have copied them by mistake, probably, in the first instance, but they’ve hijacked one of those copies and now they’re using it to produce alcohol under these certain situations? Chris - Can the fish turn this second set of enzymes on and off when they want it so they’re not producing alcohol in the summer, they’re only producing it in this wasteful way in winter when they have to? Michael - What we found is that this second set is only switched on, and massively switched on in the absence of oxygen. Chris - Why does this matter? It’s very interesting that you’ve unpicked the genetics of this and you’ve found how these fish can cope under these extreme environments, but why is this important? Michael - There’s something called foetal alcohol syndrome, which is - in humans - very important. When the mother drinks alcohol during the pregnancy, foetal development can be severely affected. 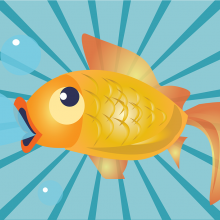 Our work contributes to this whole body of research by showing that goldfish regularly are exposed to high alcohol levels during their normal life cycles. So these goldfish have evolved ways to deal with alcohol concentrations that are above the drink/drive limit in many countries for months on end. This would severely damage the liver of a human, but we don’t know how Prussian carp and the goldfish are able to sustain this. We think there is something to find out there by looking closer into this mechanism. Chris - If you do alcohol concentration measure on your average garden pond after a particularly harsh winter, can you detect the alcohol in the water? 25:20 - What does Mars feel like? Elie - This is as close to Mars as we can get within the constraint of this facility. Elie - This facility has been purpose built for the ExoMars rover. This is the first European rover that will be launched in 2020 and will look for traces of life on Mars. Izzie - We can’t even touch Mars, how has this been designed, and created, and tailored to be as close to it as possible? Elie - There’s been a number of missions to Mars already and the American rovers have experienced a lot of different conditions, such as very soft sands in which we could get bogged down like the Spirit rover that got stuck and that killed the mission, to the Curiosity rover that experienced a lot of sharp rocks that affected the structural integrity of the wheels. But, from the data we’ve got so far, we’ve been able to recreate a landscape with rocks, with textures, with sand, with the right colour and complexity as Mars to tailor the guidance and control algorithms for the rovers. Izzie - I can see that we’ve got a rover set up in that room so are we able to go and explore that? Elie - Yes. Let’s go. Izzie - (Oh, I think I’m sinking a little bit). The converted hangar was filled with a course, golden yellow sand. That’s right - a red planet with a yellow surface, along with red, blue, orange, and white rocks of different sizes. Whilst it didn’t feel as razor sharp as Mars’s actual sand, it was gritty and rough, certainly not the type you’d want to find on a beach. It’s here in the Mars yard that the Airbus team will carry out tests to control Bruno, the ExoMars 2020 rover. You can hear him clanking about as he roamed across the yard. It’s his job to explore the red planet for any indicators of life, searching for signs of water, drilling through the surface as he goes. Elie - The ExoMars rover - the mission is going to drill down to about two metres. We’re not going to carry a two metre drill, what we’re doing is actually carrying a drill built on the same principle as an oil rig. It is made of sections that you can fit one into the other up the maximum length of about two metres. Izzie - Is there any particular reason why you’re looking into two metres, why not just explore the surface and go feeling around there? Elie - This is a good question. What we want to do is explore below one metre on the surface of Mars. To date, the science seems to indicate that the top one metre will be ionised with radiation from the cosmos and the Sun and, therefore, is not really a good place to look for traces of life. So what we want to do is to go below this one metre, and go even further and go up to two metres. Izzie - When you say life, are we talking about people as we know you and I or are we talking about little molecules that might lead on to something bigger? Elie - I think life, in this instance, would understood as almost microorganisms. We’re really talking about minute elements, minute systems that can actually live there on the planet. We are not really expecting any developed life like you and I but, you know, this is really the early days of our research in the cosmos. 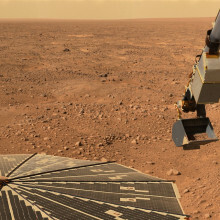 Elie - ExoMars, in the grand scheme of things, is a stepping stone towards the next big milestone in planetary exploration, which is going to be a Mars sample return mission. Izzie - In a sample return mission, one rover would go to Mars, dig around, package up samples and leave them on the surface of the planet. A second mission would send another rover to scoop these up and bring them back to us on Earth. But what if a rover get’s stuck? Elie - Hazards can be a lot of things. You can have a visual hazard that you can detect like a big rock is in the way. You don’t want to fall down a crevice or a canyon but, at the same time, you want to avoid locations where you might have some crust on the top that is just covering a layer of very soft sand. This is the worse possible case where you can actually dig yourself in. So we’re looking at different concepts to avoid these situations. One of them is to send a smaller scout rover to prod the ground ahead of this primary rover and to give a bit of a rating of the suitability of the terrain for the main rover to traverse. Alternatively, what we could do is try to build this kind of sensing inside the main rover and, in the same way as you feel the sole of your shoe to detect whether you’re walking on gravel or sand, you could actually feel at the wheel level whether you are on solid ground, or whether it is something that is about to crack. So there is a number of ways we can do that. Izzie - How far ahead are we envisioning this sort of mission? Elie - A Mars sample return mission has been on the cards for quite some time, and we’re really looking at an actual sample return potentially in the mid 2020s, probably 2030s. Izzie - So we’re not quite at the stage of building sandcastles on Mars. But, within the next few decades these huge missions will sift through the red planet’s surface and hopefully bring part of Mars back for us to hold here on planet Earth. The best way to analyse a gas of course is to sniff it! 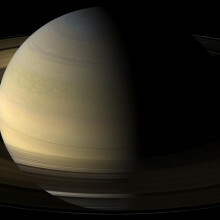 Which is what, among other things, NASA’s Cassini spacecraft has been doing around Saturn. It was launched from Earth in 1997; it arrived in 2004 and since then it’s been exploring the planet Saturn, as well as it its rings and its moons, sending back breath-taking images from more than a billion kilometres across space. The mission is almost at an end and, on 15th September, Cassini will plunge headlong into Saturn and break up. With us now to discuss some of what’s been discovered during the mission is mission scientist and atmospheric specialist Ingo Mueller-Wodarg. Ingo - The probe is about the size of a minibus and it simply is a box with large antenna on the front, a big booster rocket on the back and lots of instruments hanging out of it. Initially, it also had a little dish on the side, which was the Huygens probe, which was released into Titan in 2005. Chris - Titan, of course, is Saturn’s largest moon, isn’t it. Why were you particularly interested in Titan? Ingo - Titan is actually quite boring if you look at it through the telescope, it’s just a yellow ball. But the first Voyager flybys in the early 80s showed us that Titan has an atmosphere composed of nitrogen - a thick atmosphere. Nitrogen, of course, is also the main gas in the Earth’s atmosphere and, therefore, people were interested to find out more about this planet and its atmosphere. Chris - So you send this probe onto the surface of Titan - what did it tell you? Ingo - Huygens landed in 2005. The furthest we’ve ever landed an object from Earth away. It basically entered through the atmosphere, sniffed the atmosphere as it descended and then, most breathtakingly, it gave us the first glimpse through the global layer of haze that we normally just see through the naked eye, this yellow ball I was talking about initially. We managed, for the first time, to look underneath at the cameras on board revealed a breathtaking landscape with mountains and rivers, a smooth surface, and even lakes, but not the liquids we know from Earth. On Earth it’s water, on Titan it’s liquid methane, so it’s not something you would want to swim in. Chris - Still, not a very nice place to go and hang out though. What about the other moons of Saturn, because Saturn has quite a few and Cassini has had the privilege of being in that system for more than a decade and taking multiple passes among them? What has it seen? Ingo - The other most exciting of the 50 moons that Saturn has is Enceladus, a small icy body that nobody really expected to see anything interesting in. But it turned out that Enceladus had geysers of water coming out of the southern pole and these were discovered by Cassini for the very first time. We have looked at countless other moons, and the rings of Saturn, and Saturn itself. Chris - Just talking for a minute about Enceladus because that was really a staggering finding, wasn’t it, those jets of water that spray into space; they go enormous distances? Don’t they even, in fact, contribute to one of Saturn’s rings, the material that they’re ejecting? Ingo - Indeed, they feed one of the rings with material. In fact, this water that is emitted by Enceladus ultimately enters into the atmosphere again so it’s quite an interesting cycle of water transport over huge distances. But, looking at Enceladus as an isolated system, these geysers they come out of the cracks in the southern pole. We managed to fly through these water jets and we found that they contained molecular hydrogen, carbon dioxide, and methane amongst others. The interesting bit is that these are not chemically in equilibrium the way you would expect them to be. There’s basically too much molecular hydrogen and this could be caused by processes we also see on Earth. Basically, it’s hot water in the ocean flowing through cracks on the seafloor and then reacting with iron rich rocks to form molecular hydrogen. Chris - Could it also be, one of the things people were very excited about, were saying there’s warm water there which is encouraging because we think water is an essential ingredient for life. Could also some of this equilibrium be because there are maybe biological processes which are exploiting that very strange environment that Enceladus is providing? Ingo - These imbalances are not caused by microbial life, but they could indeed host microbial life because we see exactly the same happening on Earth. Whenever there’s a surplus on the ocean bed of molecular hydrogen, this can be used by microbial life as an energy source. Whether or not this life exists on Enceladus we don’t know, but we can say that the conditions for microbial life to exist are there. Chris - Cassini has, undoubtedly, been a staggeringly successful mission, hasn’t it? It’s gone on for all these years and returned this huge amount of information and data, and these surprised like what emerged from Enceladus. Why has the decision been made to bring the mission to a close and crash land Cassin - why are you doing that? Ingo - You’re absolutely right. It’s been a wonderful mission and all of us would love for it to continue another decade, but it’s running out of fuel. This means that there is enough fuel to power the systems, there is enough electricity on board, but there isn’t enough fuel to control the spacecraft anymore because you have to steer it on it’s orbit. We don’t want the spacecraft to get out of control and then we would risk the spacecraft landing on one of these delicate moons, for example, like Enceladus. We don’t want that to happen so that’s why we decided, while there is fuel, to bring it to a controlled end. We call it it the grande finale, because this is a whole mission again on it’s own with exciting new science to be done very close to Saturn, something which has never been done before. Chris - So it will continue to send back data to you right up until it finally gives up the ghost as it plunges into the atmosphere of Saturn? Ingo - Yes, indeed. Normally the data is saved onboard and then transmitted later once the high gain antenna points towards Earth but the exception will now be that it sends the data live while it plunges into the atmosphere. Because once it’s in there, it reaches a point where the spacecraft disintigrates and then we would have lost the data if it hadn’t been sent directly. It will be the first ever in-situ exploration of the atmosphere of Saturn. In-situ means that you sniff the atmosphere on location and this has never been done before on Saturn. Chris - It seems sad to be looking forward to the demise of something but, at the same time, it will be a spectacular demise we hope, won’t it? 40:50 - What does space sound like? Bill - Well, I think it sounds like a soundtrack from a Star Trek movie. Bill - What we’re actually listening to are radio emissions from lightning strokes after they’ve propagated into the surrounding environment around Earth, which we call it’s magnetosphere. Izzie - A magnetosphere surrounds a planet that has a magnetic field, and within lies a cloud of charged particles. These sci-fi-esque signals, called whistlers, were detected by the Van Allen probe which - surprise, surprise - got it’s name from within a region of the Earth’s magnetosphere known as the Van allen radiation belt. Bill - We’re detecting electromagnetic waves. These are like radio waves that propagate in the magnetosphere so when there are disturbances in this medium they create electromagnetic waves. Bill - The Voyager 1 recording of Jupiter’s bow shock is my favourite of all the recordings we’ve made in the last 40 years. It’s just exquisite. Bill - The first sounds that you hear are some fairly high squeaks and whistles. These are occurring in the solar wind which is approaching Jupiter’s magnetosphere - Jupiter’s magnetic bubble. Izzie - Jupiter’s magnetosphere is the largest structure in our solar system. So what happens when plasma travelling at such high speed collides with this enormous astronomical obstacle? Bill - Just like an aircraft travelling supersonically in our atmosphere, there has to be a sonic boom and, in this case, we call it a bow shock… This is where the solar wind is heated, deflected, and slowed down so that it can get round the boundary. Izzie - So how can we hear these sonic booms in space? Bill - Well, the Voyager instruments from the University of Iowa have a very simple antennae system. They have one electric dipole antennae; this is an antennae that has two long rods, each of the rods is 10 metres long, and we basically use them like you would use rabbit ears on a television, back when people did that sort of thing. Those antennas detect the electric fields of the waves in the plasma. 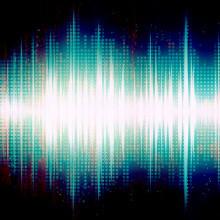 The signals from the antennae are recorded in digital form on the spacecraft and then they’re played back tot the deep space network and, eventually, to our computers. We can basically take that wave form and turn it into an mp3 file and play it through an iPod or just an amplifier and a speaker. That’s how we hear these sounds. Another instrument on Voyager, the camera took pictures of the nightside of Jupiter and saw clouds that were lit from below by lightning flashes. So these two measurements, the whistlers and the images, prove beyond a shadow of a doubt that there’s lightning in the atmosphere at Jupiter. Back in 1979, this was the first planet other than Earth for which we knew lightning existed. Izzie - This was a huge discovery, and across 40 years the team at the University of Iowa have provided radio and plasma wave receivers for more than 20 space missions. And whilst in space no-one can hear you scream, it appears there are signals which are shouting out. Luciano - A black hole is one of the most cherished objects in our imagination nowadays and yet, as a scientist, we don’t have any definitive observation that confirms their existence. 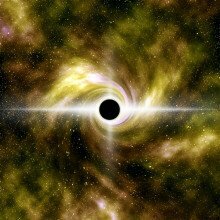 A black hole is an object which gravity’s so strong that they posses a surface which is called the event horizon where nothing, not even the lightest particle, can escape, and the lightest particle is, of course, light. So one can think of black holes as objects where gravity has the ultimate word, and where life cannot move out of this very specific surface, the event horizon. Chris - How do we know then that black holes exist if no-one’s ever seen one? Luciano - The idea is to use the indirect evidence. For instance, in the case of the supermassive black hole at the centre of our galaxy, you can convince yourself there’s a black hole because you see stars that are moving around an object which doesn’t emit any light, which is extremely massive - 4 million solar masses and yet you don’t see it. So the motion of stars near a supermassive black hole is a way of telling that there is a black hole. 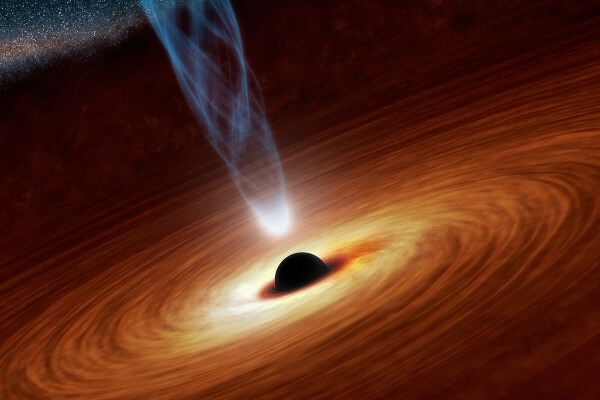 What we would like to see is “a smoking gun” for presence of black hole and that is the presence of an event horizon. That’s what we’re trying to do with this project - the event horizon telescope. Chris - I suppose it’s complicated this, because astronomy is largely based on looking at things using light and, if you’re trying to see something that doesn’t let light escape, that must be tricky? Luciano - It’s actually quite frustrating. But we do have an option here and that is given by the fact that if a black hole is immersed in a bath of radiation, of light, then there’s going to be a region out of this bath which will be darker because some of the light will not be able to reach us. This is actually what we are trying to measure and take a picture of, this region which is less luminous. It is what we call the shadow of a black hole, so through radio telescopes we’re trying to reproduce the shape of this shadow. Chris - Right, so in other words by looking out how the light that you can see behaves you can infer what must be influencing the light in that way and, therefore, work out what must be there to do that and then you can see whether your observation is a theory? Luciano - That’s right, that’s correct. And the shape can be telling a lot of information because different black holes have different theories of different properties will give you a different shadow. So, by measuring the properties of the shadow we will know a lot about the properties of the black hole. Chris - Now why has the Event Horizon Telescope been convened to do this? We’ve got lots of telescopes on Earth - why do this with them? Luciano - The problem is that light in wavelengths that are not radio tend to be absorbed, so what you want to have is radio telescopes measuring this shadow. Radio telescopes are actually ideal for this, not only because they can get the only radiation that reaches us, but also allows us to have the highest resolution. In order to have an idea of the high resolution that you need, it is like taking a picture of an orange which is placed on the surface of the moon. It’s a humongous resolution and the best telescope to give us this resolution is radio telescopes because there is a very simple rule in the resolution and that is that given a certain wavelength, you want to have the largest possible telescope to see this wavelength. In the case of the radio telescope you can get very large dishes, hundreds of metres. As a matter of fact even 100 metres would not be enough. What you really would like to have is a radio telescope which is as big as the whole planet. You may think this is just impossible. Actually it is possible and people have pioneered this technique which is called very large baseline interferometry decades ago. So the principle is you can’t have a single telescope, why don’t you have two telescopes as far apart as possible, and you just make sure they record exactly the same radio wave front. That’s what you do by synchronising these two telescopes with atomic clocks. In this case the larger is the better and if you can have more than two telescopes picking up the same wavefront the better because even the detail of this wavefront would be more precise. That’s what the Event Horizon Telescope collaboration has done this spring. It has set up a very large campaign where all the biggest telescopes scattered across the planet have recorded data, and this data we are now analysing. Chris - You’ve even got the telescope in Antarctica which has made some recordings, but you haven’t got the data from that yet because you haven’t got the hard disks back from Antarctica have you? Luciano - This is the most advanced technology to do this type of job. At the end what you really need is an aeroplane getting this data that is stored in these discs. But that’s it - you can’t win with the solar winter so we have to wait for planes to be able to land at the south pole telescope and pick up the data. Which actually is very important because the south pole telescope is the one that can always look at the galactic centre. While other telescopes would be as the Earth rotates they would not be seeing the galactic centre during some time of the day. But the most important piece of the puzzle is actually still missing and that’s why we hope that once we have that data we will have the most accurate measurements ever made of the galactic centre. Chris - So you merge the data from all of these individual telescopes, which have all looked at the same event at the same time so you know that they’re all seeing it from a slightly different viewpoint and that should, therefore, give you this very deep detailed picture. But what will the picture that ultimately emerges when you put this sort of montage or this mosaic together, what will this look like? Luciano - This will depend a lot on the quality of the data. This is data that is taken over several days, but we hope we will see some evidence of this shadow. So an evidence of a region where there’s going to be a lack of luminosity, while nearby there’s going to be a lot of emission. This is what our numerical simulations are telling us we should see. In practice, I’m not able to tell you the quality of the data up until we have processed it. We might be very lucky and see something which is very suggestive of the presence of a horizon, or we might have to try again and remove some of the uncertainties to do, for instance, with the fact that the light would be scattered and so the image would be blurry. 54:27 - Will dish soap harm my health? Does washing up liquid leave behind toxic residue on our dishes? Previous Could green humans harvest energy from the sun? Next Does washing dishes leave toxic detergent residue on plates?